This bag combines both style and American pride as it features the most famous and important structures in our country. Makes a perfect gift for anyone this summer season and is great for outdoor trips and the beach. One of our most popular items, the White House Black and Red bag is perfect for any occasion. 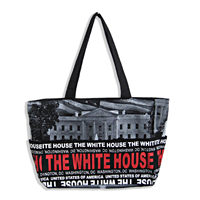 This bag features a picture of the White House along with the text "THE WHITE HOUSE" in bright bold red lettering.